Every superhero has to learn the hard way not to go to a comic convention in costume. A new spa called The Perfect You offers a chance to lose everything from weight to bad skin, and even fixes your eyes. However, Terry learns that some of his schoolmates as well as a friend of his mom’s disappears a few months after. 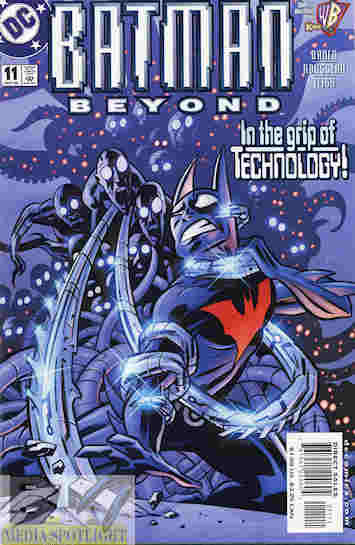 Batman goes to investigate and learns the process is done with nanites, but the director doesn’t realize that the nanites aren’t being flushed out but slowly turning the patients into machines under control of the hivemind. Batman manages to find the queen and disable it, turning everyone back to normal. What they got right: I was planning to note in the “got wrong” part that DCAU Batman seems to have a huge dislike for spa treatments. There was an episode of Batman: The Animated Series in which Poison Ivy started her own spa to do evil stuff and I think there might have been another one. Unless I’m thinking of that Iron Man issue I reviewed awhile back since it is a trope in crime dramas dating back to at least the 1970s if not earlier. Maybe the point is be happy with what you are, which seems to be the message the comic ends on. Otherwise I don’t understand why these places keep turning evil in stories, even if they do make clear that they have nothing against self-improvement during a conversation between Terry, Dana, and Max, which was a decent addition. What makes this different from the usual use of this trope is that the person in charge isn’t the villain, and isn’t even aware the nanites are fulfilling their own imperative. What they got wrong: Not that we’re told what that imperative is. I think we’re supposed to assume that they’re idea of fixing imperfections is turning people into machines or something but it’s never really stated what the end goal was. Also there’s a panel where the colorist missed a spot in a dramatic background right near the word balloon so it kind of stood out for me. Recommendation: A solid story. Worth checking out. Posted by ShadowWing Tronix on April 15, 2019 in Animation Spotlight, DC Spotlight, Television Spotlight, Yesterday's Comics and tagged Batman, DC animated universe, DC Comics, DCAU, Terry McGinnis.